Info "Separate the ocean dwellers from the desert dwellers." Climate Control is one of Tiny Wario's Microgames in WarioWare: Smooth Moves. The player must control the tilting platform in the middle and direct it left or right. 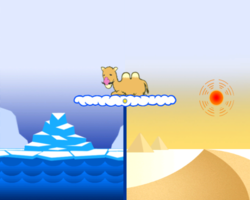 A creature will fall and the player must sort it in the right section: left section (glacier) and right section (desert). Such creatures can include otters, crabs and penguins (which should fall on the glacier side); scorpions, cacti and sphinxes (which should go to the desert). If a creature is placed in the wrong side it will freeze or disintegrate. 1st level difficulty: One creature. 2nd level difficulty: Two creatures. 3rd level difficulty: Three creatures. This page was last edited on February 20, 2018, at 18:02.